In all my daze and confusion during our recent trip to New Mexico and California, I never forgot What I Ate Wednesday. One week I had to post a non-food edition, but hey, I still TALKED about food and I was here for the party. I’m feeling more like a human now and I’m getting back to more of a normal routine…well, normal for me at least! Remember that this fun food fest is brought to you by Jenn over at Peas & Crayons. Be sure to visit all of the other fun food people over there when you’re finished here…Leave some comments, Kids! It’s Fall and I love Jenn’s new WIAW logo…there I said it! Tuesday was the first day where I felt back on track in food and in other aspects. Started with a good breakfast. Barbara’s shredded oats-leftover and brought back from NM. I can’t find them anywhere in the regular grocery stores here. I have to start looking further afield. Delicious with the Silk Pure Almond! This bowl makes me Happy! In my effort to get back on track, I made egg salad in the morning. It’s a great thing to have on hand because both Ralph and I can eat it for lunches (oh, Ok, for snacks sometimes too!) A big plop of it (Ok, I measured…it was a half cup) on top of some of the leftover salad from the big salad I made to take to Ele’s on Saturday night. I love when I have already made salad in the fridge. I should probably do it more often. A little bit of Mrs. Dash Fiesta Lime and some pickled jalapeno spiced it up. I’ve recently gotten hooked by these tasty beauties. I had them at Ele’s house and I can get them in a jar at Aldi…cheap! I forget what I paid, but I’ve put them in eggs, on veggie burgers…Yum! Also love my Free yellow bowl! Perfect size for lunch. Dinner was fairly standard…the rest of the leftover salad with some added celery, green bell peppers and tomatoes (which didn’t go in until after the photo!) Topped with some shredded cheese and Catalina dressing (also brought back unopened from NM, couldn’t open it because of the fridge issues) Oh, yes…a Morningstar Farms spicy black bean burger, too. They are still my favorite! All mixed up in my very favorite…The Big Purple Bowl!! We’ve had a great deal of rain the last few days and even though I’ve been starting to feel like getting out to walk again, the weather has Not cooperated. I know I need to start to get exercise again. So it was 40 minutes on the exercise bike for me. Great way to get some exercise in and some reading…well I’m exercising too, right?! 😉 Wish I had a treadmill…once we move, I’m voting for a treadmill! I also feel VERY accomplished because I did a lot toward sorting and packing. My hairdresser is buying a set of dishes that I had packed away. They were packed in plastic bins wrapped in clothes. I thought they were my clothes but they were shirts of Ralph’s. As I packed up the dishes in the new way I’ve learned (I’ll explain that sometime!) Ralph tried on all of the shirts to see if they still fit. 😦 Only weeded out one shirt, but I’ll find more. Three plastic bins OUT of the bedroom and ready to be packed with something else! Moving them out allowed me to get to several boxes that were marked “Books Not Read.” OK! I went through those books (mostly Goodwill finds so-Cheap!) Found two duplicates of things I’ve bought again, because I didn’t realize I had them! But weeded through them as well, pulling out books I don’t think I really want to read. More for the Yard Sale…Hooray!! I was able to then pack in some others that were in my towering (toppling) To Read pile. I now have more room in the bedroom and more fodder for the Yard Sale! That brings us to the end of What I Ate Wednesday…And Everything Else I Did!! I felt very accomplished by the end of the day. I need more days like this in the food department and in the sorting and packing department as well! I think it’s still rainy out there, so no walk for me today, but I WILL be on the bike! Don’t forget…hope over to Peas & Crayons to check out what all the WIAW cuties are posting today! Happy What I Ate Wednesday! I Need To Go Do A Project!!! 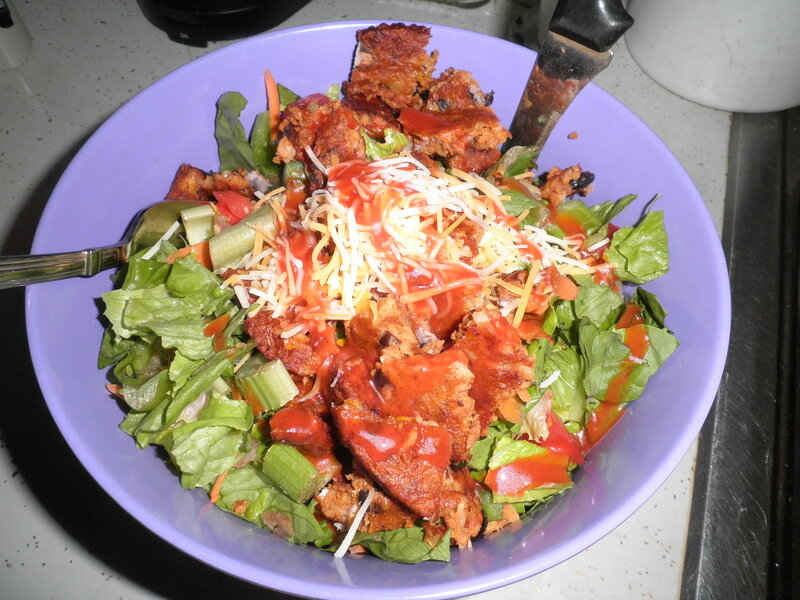 This entry was posted in Uncategorized and tagged salads, sorting and packing, veggie burgers, WIAW. Bookmark the permalink. give yourself a pat on the back, fran! you had a great day of getting stuff done! i love that almond milk – have the exact same carton in my fridge right now (it was on sale, to boot!). it poured rain here yesterday, too – i think today we’re back to sun, yippee! very happy to see BPB again…and the yellow one! Thanks, Cathy! I love the almond milk and a sale…what can I say! I don’t think I’ve ever seen it on sale…Yay for you! So glad to be back to my routine with food. I’m feeling much better! I so know what you mean! I sorted out my wardrobe yesterday which I’ve been wanting to do for YEARS already and now I feel so much lighter,haha 😀 It’s amazing! Kat, I love the almond milk. Like you, I’m the only one who uses it so it’s a healthy treat. It lasts a long time too and doesn’t seem to spoil whichis a plus! Have a great day! Your meals look very healthy. Yes it is a great feeling when you do some decluttering. Since having a baby my house has become a crazy mess of baby stuff. I don’t get time to use any of my own stuff so feel like just throwing away my stuff to make room for hers. The more stuff you have the more weighed down you feel so it’s’ great to have a sort out. Hi Katherine! I hope to continue my de-cluttering! If I could get paid for all of the “stuff” that needs to go, I’d be well on my way to having enough money to move! Thanks for visiting and have a great day! No, Allie, no Kroger… 😦 I think Wegman’s might sell them. Need to make a pilgrimage up there. YES!! 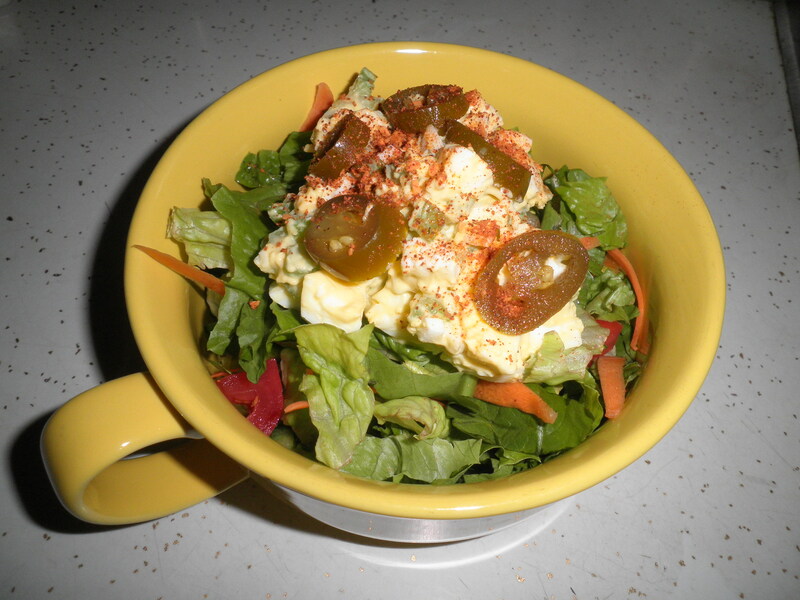 I love the Fiest Lime Mrs. Dash…so good on eggs in general…egg salad in particular. I put it in Lots of things…Go Find It!! Great idea, Allie! When we were in NM, since I didn’t want to buy a lot of spices that would probably sit there for a year until I used them and since I wouldn’t want to bring them home because I have everything here, I bought Mrs. Dash. It is just the best! You can use it on everything! I actually think I need some more. We don’t have Costco, but I’ll have to check at BJ’s to see if the have the big ones you were talking about. BJ’s is like Sam’s Club (Walmart) I’ve never been to a Costco, but I’ll bet they’re very similar. My best friend Gail has a Sam’s membership so I go there with her. She’s been in Main all summer though. 😦 I miss her. Great looking salads! I love the jalapenos on it. Need to try that on my salads sometime soon! Hi Carolyn! I just got into the jarred jalepenos…they are so good. Not too hot but tangy and tasty. They add a lot to a dish! Happy WIAW! Glad to see the return of your big purple bowl! 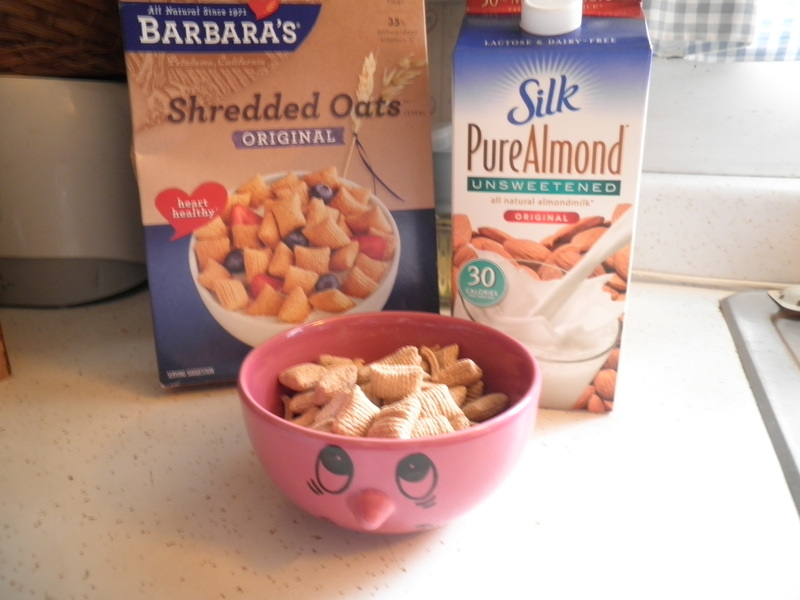 You can find the Barbara’s cereal at Stop and Shops if they are in New Jersey and they are in the organic isle. Trader Joe’s has them as well. I am from New York so that’s where i buy the cereal and its delish! I want a treadmill too!!! Way to be productive. Organizing and packing/unpacking is my least favorite chore. I’m still working on it in our new house! Corrie Anne, I’ve packed and unpacked SO many times in my life. I’ve got to get this done, because I desparately want to get to New Mexico!! I keep trying!